The photo of the year 2015 was published 18th of October in Finland by Finnish Nature Photographers. In category Human and nature the winner photo was Victim of the Wind Turbine (taken by Seppo Keränen / White-tailed Eagle). Seppo Keränen took the picture about dead White-tailed Eagle in Pori Peittoo in November 2014. The eagle had flied to the blade of wind turbine and it was the last flight for this brave bird. White-tailed eagle is classified as vulnerable species in Finland, and the killing the eagle is quite costly: according to Ministry of the Environment´s decision, the price of white-tailed eagle is defined as 7.400 €. It would be interesting to find out who paid the life of this eagle? There are 12 wind turbines (4,5 MW Gamesa) in Peittoo`s windpark. Pori is located on the west coast of Finland. Cet aigle est classé en Finlande comme une espèce vulnérable, et tuer un de ces aigles peut coûter très cher :Selon la décision du Ministre de l'environnement la pénalité peut atteindre 7.400 euros. Ce serait interessant de connaitre qui a du payé pour avoir tué cet aigle? Il y a 12 éoliennes de 4,5 MW de Gamesa dans le parc éolien de Peitoo. Pori est sité sur la cote ouest du pays. Dear all, in Finland there is happening a change in atmosphere what comes to wind turbines, I think. Wind turbines has been raised in the public by some of the key influencers: with increasing criticism. This week will be important time for us... We will tell you more when we can. The photo of the year 2015 was published yesterday in Finland by Finnish nature photographers. 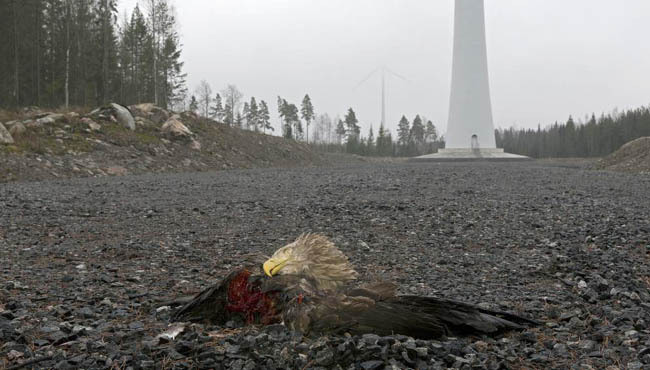 In category Human and nature the winner photo was Victim of the Wind Turbine (taken by Seppo Keränen / White-tailed Eagle).